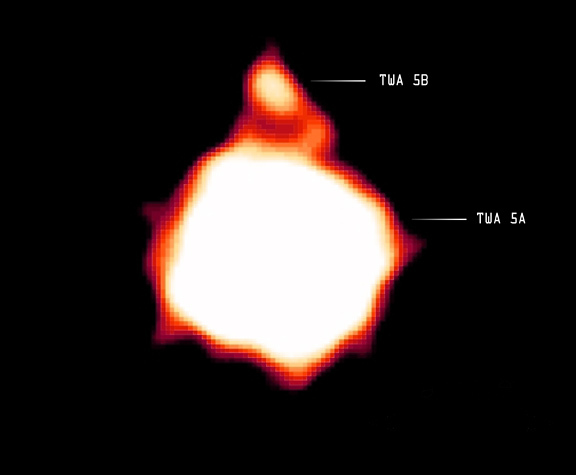 A Chandra observation revealed X-rays produced by TWA 5B, a brown dwarf orbiting a young binary star system known as TWA 5A. The star system is 180 light years from the Earth and a member of a group of about a dozen young stars in the constellation Hydra. The brown dwarf orbits the binary star system at a distance about 2.75 times that of Pluto's orbit around the Sun. The sizes of the sources in the image are due to an instrumental effect that causes the spreading of pointlike sources. 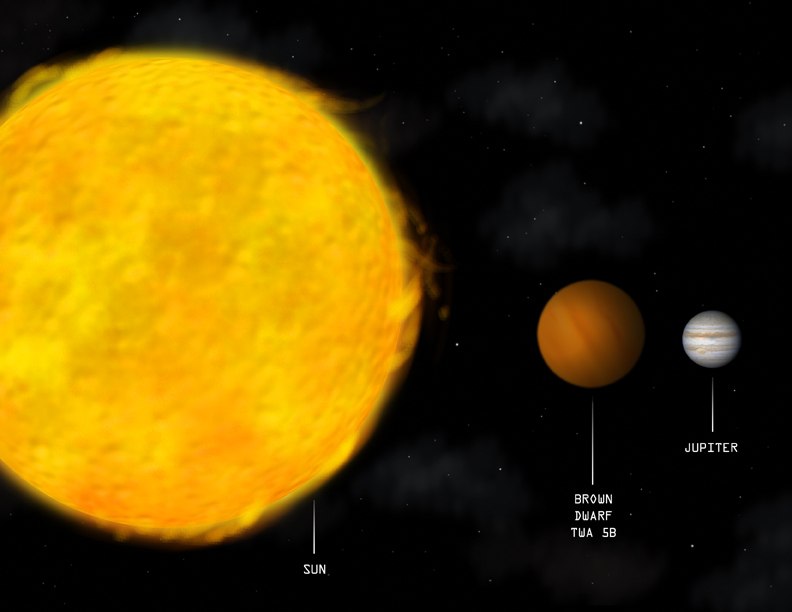 For a comparison of the actual size of TWA 5B to the Sun and the planet Jupiter, see the illustration below. Brown dwarfs are often referred to as "failed stars" because they are under the mass limit (about 80 Jupiter masses, or 8 percent of the mass of the Sun) needed to spark the nuclear fusion of hydrogen to helium which supplies the energy for stars such as the Sun. Lacking any central energy source, brown dwarfs are intrinsically faint and draw their energy from a very gradual shrinkage or collapse. Young brown dwarfs, like young stars, have turbulent interiors. When combined with rapid rotation, this turbulent motion can lead to a tangled magnetic field that can heat their upper atmospheres, or coronas, to a few million degrees Celsius. The X-rays from both TWA 5A and TWA 5B are from their hot coronas. TWA 5B is estimated to be only between 15 and 40 times the mass of Jupiter, making it one of the least massive brown dwarfs known. Its mass is rather near the boundary (about 12 Jupiter masses) between planets and brown dwarfs, so these results could have implications for the possible X-ray detection of very massive planets around stars. Credit NASA/CXC/Chuo U./Y.Tsuboi et al. Coordinates (J2000) RA 11h 31m 55.40s | Dec -34° 36’ 27.00"